Observation - Lepraria ecorticata? - UK and Ireland. Description: Do not seem to be able to identify this lichen, even the colour does not match anything. It's growing in recesses at the bottom of our dry stone wall. 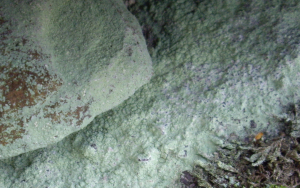 Do not seem to be able to identify this lichen, even the colour does not match anything. It's growing in recesses at the bottom of our dry stone wall.